To celebrate is 130 years of innovations and exceptional craftsmanship, PARKER has created the Duofold Limited Edition, the Craft of Traveling with 1,300 fountain pens, in homage to its founder, George S. Parker and his passion to discover the world. Travel through time, cultures and geographies with Parker. Parker is launching the 2018 Duofold Limited Edition to celebrate its 130th anniversary and to pay tribute to its founder, George Safford Parker. He went on his first trip to Paris in 1900 to discover the wonders of the Exposition Universelle. His passion for travel took him around the world, from Egypt to South America, and China where he traveled many times to purchase traditional iron paintings in Wuhu, in the Anhui province. The Orient fostered his imagination and creation, giving birth to the Mandarin Yellow Duofold color, inspired from a vase George once found in Japan. Only 1,300 numbered pieces of the 2018 Duofold Limited Edition will be produced, as a testament to its 130th anniversary. The pattern from the cap is inspired by the diagram of the globe looked at from the poles. The blue semi- precious stone at the top of the cap is a Lapis Lazuli that evokes the colors of the ocean on which George had so frequently travelled. Each stone is delicately selected and will be unique with its own design. The body is brass with a lazered golden lines map covered with a deep blue colored enamel with 22 components manually assembled in Nantes (France). The bi-color gold nib features a compass eluding to the science of navigation and the steamships George used while traveling the world and the nib is 18kt gold in fine or medium width with after sale exchange available in XF and B. Cartridge/converter fill. Certificate of Authenticity signed by Geoffrey Parker, great grandson of George Parker. Continuing its celebration of 125 years of unique craftsmanship and design innovation, Parker now unveils the Duofold Senior 125th Anniversary Limited Edition Fountain Pen, a sumptuous and bold pen available in only 1,125 unique pieces worldwide. Drawing its inspiration from the iconic Duofold Giant, the new Senior is a finely crafted pen of exceptional poise and high caliber in refined black and silver. The limited edition is a modern and luxurious illustration of the visionary spirit of Company founder, George S. Parker, when he first conceived the acclaimed Duofold. The new Duofold revisits the Parker patented cisele pattern, a chiseled metalwork first seen on the Parker 75 range in the 1960s, which garnered global acclaim and became an undeniable hallmark of the ingenuity of the brand. The Duofold Senior 125th Anniversary Limited Edition boasts a beautiful combination of silver-plated casing and precious black resin resulting in a pleasurable tactile feel. For the finishing touch, the Senior Centennial-sized medium nib is rendered in precious 18kt solid gold, swathed in high-shine rhodium and engraved with the famous Parker arrow motif. Cartridge/converter fill, the Duofold Senior 125th Anniversary Limited Edition Fountain Pen is presented in an elegant black lacquered wood box with its certificate of authenticity. Parker 2012 Year of the Dragon Limited Edition Ingenuity - Parker pays tribute to the most important mythical creature in Chinese culture with its limited edition Ingenuity Red Dragon. First released in China to celebrate the 2012 Year of the Dragon, the pen is limited to 8,000 pieces worldwide. The pen body is lacquered in red (for good luck) and etched with a gold-plated dragon on the barrel (for prosperity). The Ingenuity combines the best features of a fountain pen, ballpoint pen, rollerball and felt-tip with its cutting-edge refill point that is covered by a metallic hood fashioned like a nib. It adjusts to your writing style after just a few words, providing you with a flexible and smooth gliding point that will not leak or smudge. Capture the energy and strength of the mightiest sign of the Chinese Zodiac with Parker*s stunning Year of the Dragon. The innovative design of this special Centennial size piece was inspired by the helical pattern of DNA � the essence of life itself. Created in pearlescent smoke grey resin and precision chiseled from solid material, it gives an incredible tactile sensation. The decorative trims, special cap decal and the arrow clip are platinum plated. The intricately engraved cap band echoes rare examples held in the Parker archives. The platinum plated 18 carat gold nib, tipped with hard wearing alloy is formed from a tapered section strip which ensures flexible, smooth and long lasting writing pleasure. The limited edition nib fitted to this pen is only available in medium width. Cartridge/converter fill. It is limited to a worldwide distribution of 1088 pieces. ONLY 288 PENS WORLDWIDE! !Inspired by the serene beauty of Eastern craftsmanship, the MAKI-E LEAPING CARP LIMITED EDITION is a glorious tapestry of symbol and skill woven together in a tale of many cultures. Using an infinitely delicate Japanese art, the noble Carp jumping over the Dragon Gate is brought to life. Using a complex blend of traditional lacquer applications, the satin finish maki-e and glossy flecked nashi-ji join with the unsurpassed quality of DUOFOLD to produce a unique work of art. Cartridge/converter fill with the timeless, 18 kt gold Duofold nib in medium width. The Parker Pen Company was born in 1888, as a result of George Safford Parker's desire to improve the flawed pens of that era. In 1894, the Lucky Curve ink feeder was introduced, the company's first major innovation that greatly reduced the leakage that plagued the fountain pens of that time. The birth of the iconic Duofold in 1921 heralded a Golden Age for writing instruments. This Lucky 8 Limited Edition celebrates Parker's 120-year heritage of excellence and a series of remarkable coincidences surrounding the number 8 and Luck(Parker's birth year of 1888; the auspiciousnes of the number 8 in Chinese culture-representing luck and prosperity; and Parker's famed Lucky Curve feeder innovation). Utilizing classic design esthetics, the Lucky 8's body of precision-machined cast acrylic features 8 facets, all in black with smoke-grey ripple effect throughout---unique to each pen. Cartridge-converter fill, the large, 18 kt gold, medium width nib, features the Parker logo of the 1920's. Limited to 3,888 individually numbered pens worldwide. In 1928, Parker launched a range of startlingly contemporary pens � a new blue in a modern, highly decorative style that stood out from the plainer, more conventional patterning of that period. Over time this unique pen became known as the TRUE BLUE. Parker presents a replica of the True Blue of the 1920�s and a composition of natural complimentary beauty - the Duofold True Blue is decorated with a free-form natural flame swirl. Each True Blue is in the Centennial size and is constructed from precision machined, diffusion bonded cast acrylic that has been ultra polished for optimal wear resistance. The pen is enhanced with an 18kt gold medium nib and is cartridge/converter fill. 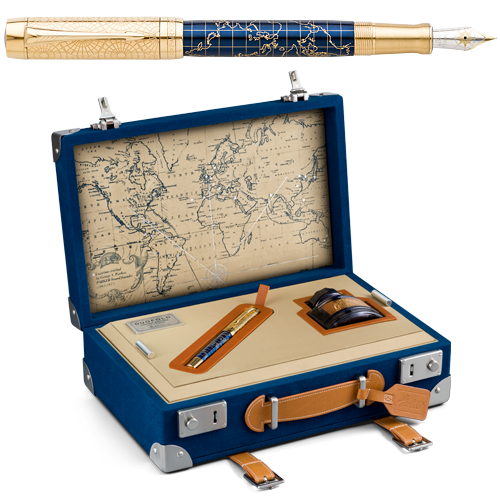 The Duofold sits in a stunning lacquer finished, veneered wood case of the deepest, most luxurious blue and includes an illustrated booklet and an individually numbered warranty card and a bottle of Penman ink. ONLY 150 PENS WORLDWIDE! !Inspired by the serene beauty of Eastern craftsmanship, the BAMBOO PANDA MAKI-E LIMITED EDITION is a glorious tapestry of symbol and skill woven together in a tale of two cultures. The Cloisonn� Yellow commemorates the Parker Duofold Mandarin Yellow of 1927. Each pen is individually numbered and comes in wood presentation box with a bottle of Penman ink. The fountain pen features a medium 18kt gold nib. Cartridge/converter fill.